Crypto Growth Hub Review – Deceptive Bitcoin Doubling Scam! Crypto Growth Hub (CryptoGrowthHub.com) is an online platform that allegedly provides investment services to day traders and crypto investors of all experience levels. According to their site, they were founded in 2016 and since then have delivered valuable and promising services to individuals across the globe. While all seems to be in order regarding Crypto Growth Hub, the information disclosed in our unbiased review below will illustrate a different angle regarding the legitimacy of Crypto Growth Hub. To gather the facts and acquire a better understanding regarding Crypto Growth Hub, we invite you to continue reading our honest review. Crypto Growth Hub does not provide much information regarding what they are offering. Instead, Crypto Growth Hub employs more a generalized education format where cryptocurrency investors believe they can find information of value regarding cryptocurrencies. It isn’t until further analysis into Crypto Growth Hub do we encounter any signs to what Crypto Growth Hub actually is. While Crypto Growth Hub doesn’t outrightly suggest that they provide managed cryptocurrency investment options, the testimonials incorporated further down their homepage suggests just that. According to their site, they have over 5,500 investors while accumulating 30,900 investments to date. In order to receive any further information regarding how Crypto Growth Hub manages your cryptocurrency investments, prospective investors have to register with their site. From there you’ll be able to access to their portal, select a preferred cryptocurrency and invest. Crypto Growth Hub does not include a payment ledger or cryptocurrency wallet address for use to verify that their platform is indeed compensating their investors. The minimum investment sums offered through Crypto Growth Hub are as followed: 0.15 BTC, 20 LTC, 5 ETH or 4 BCH. The only reference to what exactly Crypto Growth Hub is offering can be found in their FAQ section. According to the FAQ section, Crypto Growth Hub uses a custom high-frequency trading algorithm deployed by a team of cryptocurrency and forex traders, cryptocurrency analysts, risk evaluators, developers and miners to double the investment return for each investment. So if you invest 2 bitcoins into Crypto Growth Hub, you’ll allegedly receive a return of 4 bitcoins within their 7 day return period. Sounds a little too good to be true, don’t you think? Who is Behind Crypto Growth Hub? As expected, Crypto Growth Hub does not share any information regarding their owners or operators. Their Contact Us page provides us with the physical address of 2172 Greenwich St, San Fransisco, CA 94123 USA. However, when you search that address in a search engine, you may notice how the address does not reflect a building referencing to Crypto Growth Hub. Instead what you’ll see is a nail care salon, an ATM machine and residential housing for sale. Now, why would an investment company go through all the work to hide their identity from their investors? The answer is easy enough to deduce since it is evident that Crypto Growth Hub is NOT a legitimate investment opportunity. Where we really put the nail in the coffin for Crypto Growth Hub would be when we investigated further into their so-called user testimonials. As you can gather the image below, Crypto Growth Hub employs stock photos to serve as fictitious testimonials of users who are experiencing ‘success’ with Crypto Growth Hub. When investigating further into the fictitious entities used as phony testimonials for Crypto Growth Hub, we noticed that the testimonials connected to a different investment entity known as AllCoinHolder.com. Upon further investigation, it became evident rather quickly that AllCoinHolder and CryptoGrowthHub are virtually the same illegitimate investment opportunity. Incorporating many of the same fake testimonials but with different aliases along with copying and pasting many of the textual elements from one site to the next, it is clear these two operations are likely created by the same scammers. CryptoGrowthHub.com was a privately registered domain that was created on October 12th, 2018 through the Hostinger, UAB registrar. AllCoinHolder.com, an affiliated entity of Crypto Growth Hub, was privately registered on October 5th, 2018 also through the Hostinger, UAB registrar. As you can see, only a week separates the creation date of both of these sites while they are both registered through the same registrar. This discovery only led to a stronger correlation of the likelihood that Crypto Growth Hub and All Coin Holder are created by the same fraudsters while directly contradicting their claim of being around since 2016. Is Crypto Growth Hub Legit? Given the information we shared in our review above, we believe it is evident that Crypto Growth Hub AND All Coin Holder are NOT legitimate investment platforms! Crypto Growth Hub’s bold claim that it can double an investors investment within a 7 day period is downright ludicrous and definitely not the first time we’ve encountered this unrealistic ROI. To add, Crypto Growth Hub does not disclose any identifying information while their address does not appear legitimate. Let’s not forget that Crypto Growth Hub incorporate fictitious user testimonials too. 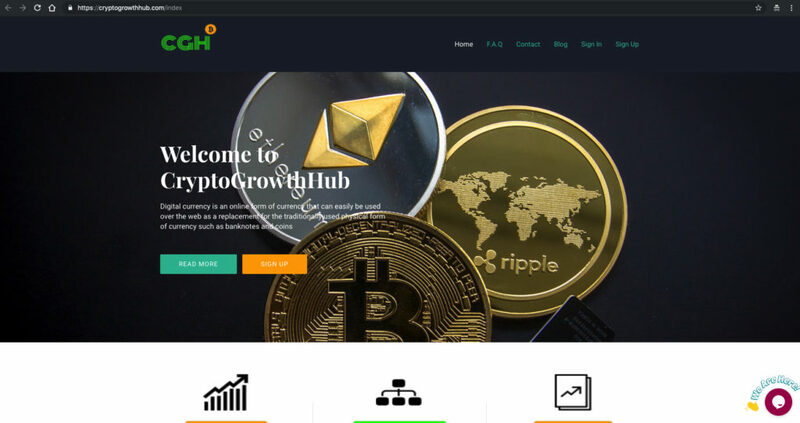 Crypto Growth Hub is a misleading cryptocurrency investment scheme that relies upon fabricated site elements to appear more legitimate. Relying heavily upon fictitious user testimonials while promoting the highly unrealistic assertion that they can double your investments within a weeks time is the living embodiment of an investment venture that is too good to be true. Don’t enable yourself to fall victim to these feeble Bitcoin doubling schemes, they are downright unethical and not legitimate. With this in mind we are going to bring our review to a close but we believe our stance is firm and well-known regarding Crypto Growth Hub and All Coin Holder. Verdict: Crypto Growth Hub is a SCAM! We invite you to share any experiences, feedback or insight you may have below! Cryptogrowthhub.com is a fraud site. Please do not fall into the sugar coated words mentioned on their website. I am already a victim and have lost a huge amount of money. They do not maintain any data of your balance and come up with weird excuses for not completing the payment transaction to your crypto account. They just make you invest more and more and lure you. I am not sure how to get my coins back from those bastards. Please DO NOT use this company. I did my homework and lost no money. I hope you do the same. I totally agree with your report that Cryptogrowthhub.com are crooks and u should have reported earlier as I’m a victim already. People pls be aware of these crooks and they should be arrested and put behind bars for good. Anybody know how to track them down? I’ve lost my savings with them already. Any recourse to get back my coins from them?